This function block is used to read and dissect the single items of a user defined data structure. The data structure can be connected to the input X. The values of the items of the structure can be read at the output connectors. There can be at most eight outputs to read the values of the items. 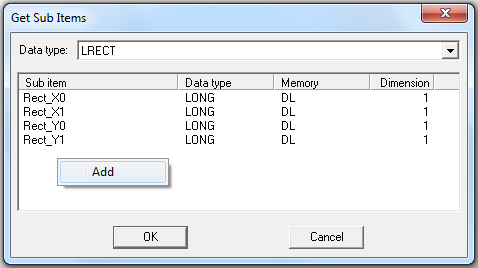 In the parameter dialog the data type can be selected. By right-clicking into the dialog area, it is possible to add elements to the structure, which creates a new input for that item. The same data structure item can be assigned to different output connectors. The following example shows how a user defined data structure is created with some initial values. These values are read and displayed. After that the values of the items are overwritten. The new values are then read and displayed again.